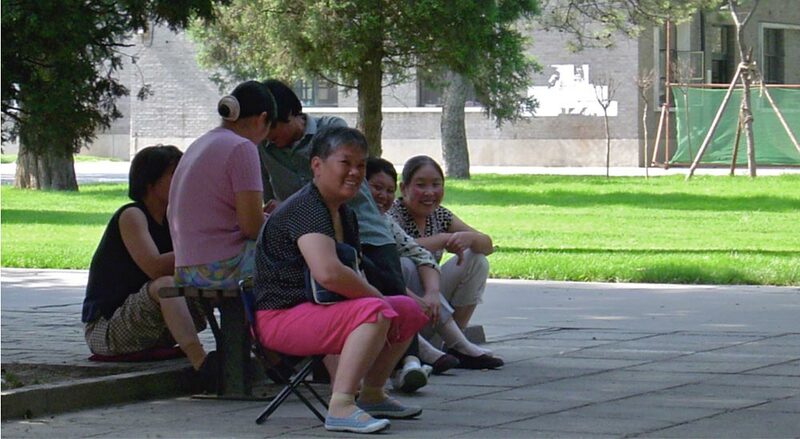 In 2006 in collaboration with my partner Richard Sarco-Thomas I danced a series of site-based improvisation performances with trees as part of a peripatetic, over-land journey from Devon, England to Guangdong, China. 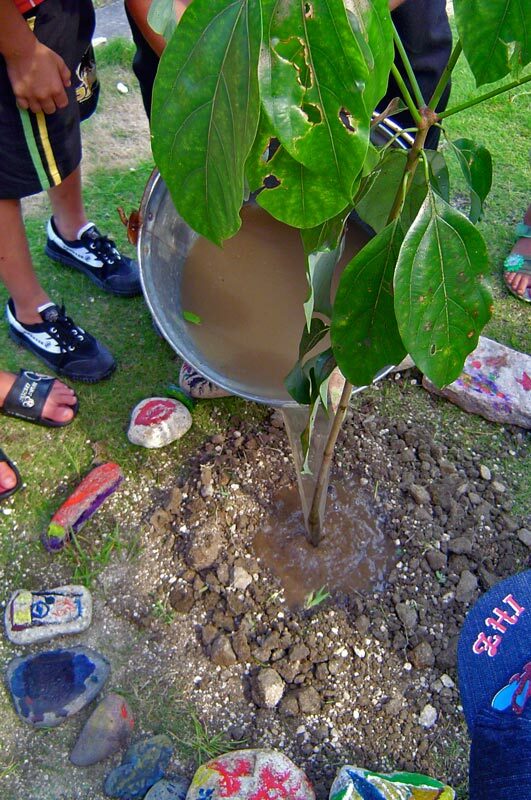 The project sought to answer the question, “how can improvisation be a practice of ecology?” The solo performances, called Twig Dances, were part of a larger initiative called TWIG: Together We Integrate Growth, which involved planting trees and giving workshops and presentations to schools along our route, addressing the conditions and effects of global warming. 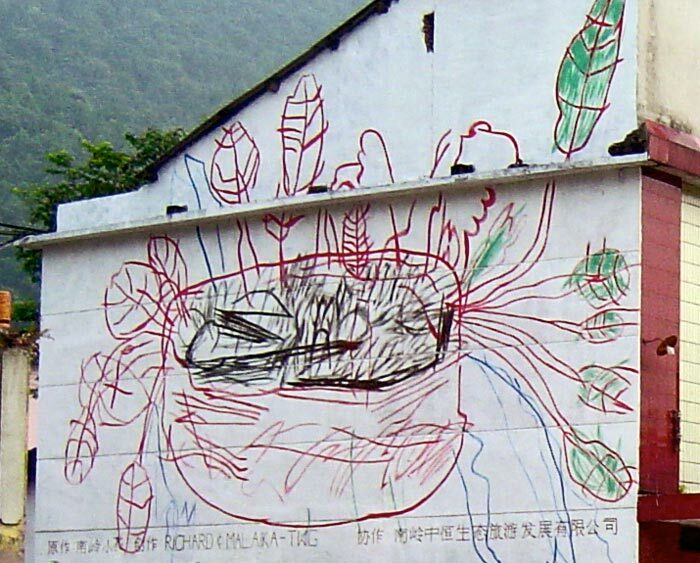 Once in Guangdong’s Ruyang village, we worked with 136 local children to devise a series of workshops and performances that took perception of the environment as a starting point for making art. Besides referring to a slender branch or shoot, the word “twig” in informal British English also means “to understand or realize something”. Figure 1. 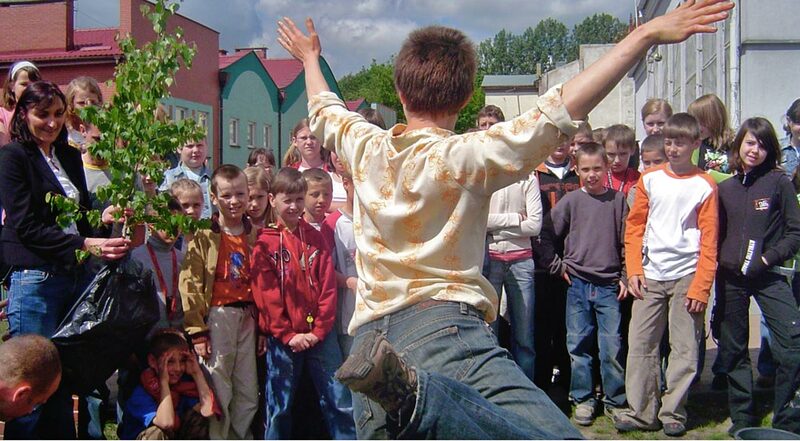 Twig Dance and tree planting at Iwava School, Poland. Photo: Richard Sarco-Thomas. Where our motives in starting the TWIG project were based on principles such as contribution versus consumption, practical versus didactic, and improvisation versus prescription, our learning curved to include a number of discoveries about the evolving nature of TWIG as a movement reaching across unexpected social, biological, economic, cultural and theoretical planes – a movement whose activities were unavoidably paradoxical. What if together we integrate growth, while remaining positionless about what growth is or looks like? Figure 2. 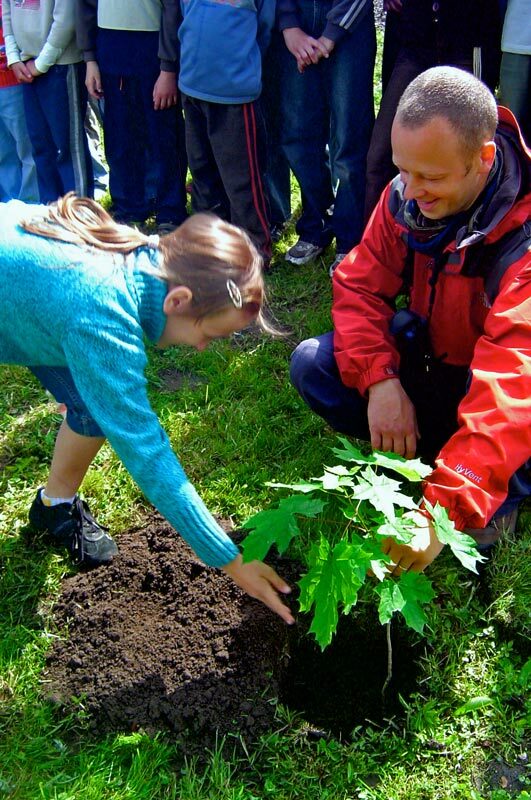 Tree planting with TWIG at Grommotte Primary School, Poland. Photo: Malaika Sarco-Thomas. Felix Guattari’s notion of transversality describes a quality of social gathering that both resists and ruptures hierarchical ordering. Key to “ecosophy”, transversality enables agency and makes possible a freedom of movement and exchange along unregulated channels (Guattari 2000). According to Susan Kelly, transversality in the arts involves “experimentation rather than representation and a focus on means: on activity that brings into proximity the why and the how of coming together” (Kelly 2005). Transversality between humans and non-humans within the TWIG Project was made possible through a number of paradoxical scores for action. What if improvisation is both knowing and not knowing? Figure 3. 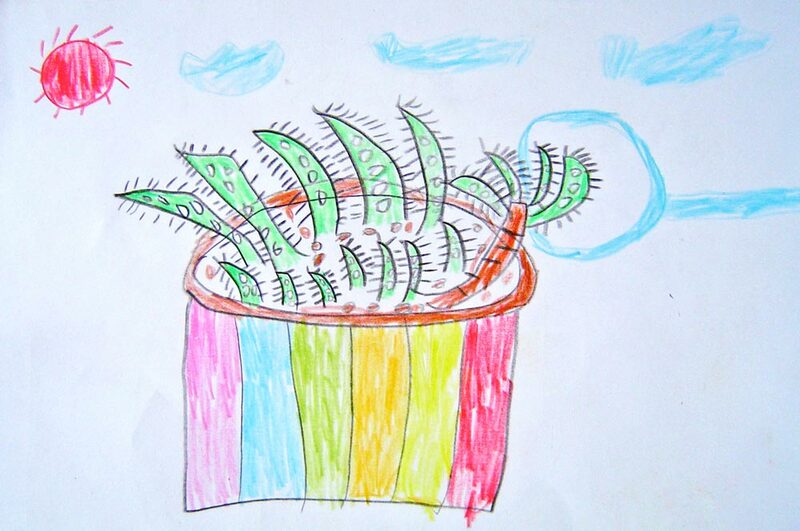 Aloe plant observation by TWIG Project participant age 10, Ruyang China. Figure 4. Tree Planting with TWIG Project at Ruyang village school, China. Figure 5. Completed mural made from drawing by TWIG Project Participant age 9, Ruyang China. “transversal practices” must often negotiate a double and sometimes paradoxical move. A logic of refusal – of resisting visibility, or taking on recognisable forms. This refusal while running serious risks of invisibility, marginalisation, or inoperability, however also becomes a condition for an opening out of another logic, […] that in order to defend something you might also need to displace it, and its categorisation at the same time (Kelly 2005, emphasis mine). Destabilizing TWIG as solely an “institution”, “pedagogy”, “political project” or “community” then, requires locating paradox in our improvisational working processes. We asked: How can we teach without leading, facilitate without imposing, author without encouraging imitation? As we delivered workshops, improvisation became a tool whereby we sought to respond appropriately to our changing environment while remaining maximally alert. I return in my mind’s eye to the northern slope of Bald Mountain on which I live. I look around and—pronto! Something happens. I see snow. I jump and curl in air. Hands and feet in air. Heavy rattle winter wind smashes dry sunflower stalks. Again. Again, smash, jump! Snow thud falls from laden roof. Feet slide out, thud. Whole body, thud, flat to floor (Forti 2004: 53). “What if every cell in my body at once perceives and performs the unique character of this plant, here and now?”. A proposition which seems absurd, contradictory or impossible, but which actually is or may be true, is a paradox. In dance improvisation practice, paradox offers a way of associating seemingly dissonant elements in theory and action. In Twig Dances I improvise with the idea of “becoming” a tree. I call this “reflective paradox” as it describes a seemingly contradictory situation: I cannot become a tree physically, but in my imagination I can. I also use paradox within my score, as an instruction by which to relate myself to the tree: “What if every cell in my body understands this beach grass through moving it?” I call this “active paradox” as it is a tactical disengagement with familiar modes of thinking in an effort to ignite basic sensory capacities (15). In ecological practice, active paradox can be used to undermine hierarchical notions and re-examine preconceptions, and to operate as a “plane of consistency” whereby procedures of working do not pre-determine products. Deleuze and Guattari’s plane of consistency resists organization, acts as a location for flows, and “does not pre-exist the movements of deterritorialisation that unravel it, the lines of flight that draw it and… the becomings that compose it” (Deleuze and Guattari 2003, p. 270). “Consistency” refers to connective movement, like a viscous substance which flows at different speeds and encompasses heterogeneities without imposing a solid structure. As a confident proclamation of intellectual uncertainty, active paradox can support a viscous attention in multiple directions; it can offer a suspension of belief that enables new learning to take place. In performance, a tactic of paradox sets the stage for a playful and productive engagement with improvisation and environment, sharpening tools of perception and enabling bodily curiosity toward, and response-ability to, “the other”. In some cases, this “other” might be one’s own body. Dance artist Deborah Hay defamiliarises the egoic singularity of “the body” by considering it as “63 trillion cells”, whom she calls “the teacher”. Using paradoxical scores for movement enquiry, she instructs dancers to: “Ask the question, notice the response, whole body the teacher”. An example you the reader can try if you like, is to ask the following question of your body: “What if 63 trillion cells surrender the pattern of facing a single direction?” Repeat the question a few times and see what changes in your physicality, even on a micro level. Ask the question, notice the response, whole body the teacher. Upon trying Hay’s scores for myself, I thought, if cells can be teachers perhaps they can teach other subjects too. In the same year David Abram’s Spell of the Sensuous was published, Bronislaw Szerszynski (Szerszynski 1996) argued that modernist divisions between language and world continue to trump the ability to prescribe “right” ecological action, as it underpins belief in an ultimately nihilistic world picture. Szerszynski posits that the various strands of thought emerging from the modernist period must be acknowledged for their historical situation, and ways forward must address the modernist schism between language and the world. Abram’s text, then, drew on Maurice Merleau-Ponty’s phenomenological theories of engagement to forge a notion of experience whereby the world (cells, twigs, stars) can be understood as having language beyond that which humans bestow upon it. Through enhancing perception, argued Abram, we might come to comprehend what the non-human world articulates, and in this process come to a more nuanced understanding and responsive relationship with this world. Merleau-Ponty suggests that understanding an object involves seeing it, not as an amalgamation of visual impressions, but as “a structure accessible to inspection by the body” (Merleau-Ponty 1962, pp. 320, 369). He describes this inspection as a lived experience, and, drawing on Henri Bergson’s ideas of intuition, implies that the body has an instinctive, paradoxical tendency by which it links itself, in movement, to objects, “like a hand to an instrument” (Merleau-Ponty 1963, p. 5). To illuminate the paradox in bodily relationship with the world can be to break from a conditional, objectified understanding of action as mediated by circumstances, but also to recognize the potential of the body to interpret or “live” the world in new ways. Improvisational scores for movement offer this possibility. The emerging discipline of eco-phenomenology claims that phenomenology’s methods offer needed, experience-based insights into our ecological situation and enable a study of the metaphysical and axiological dimensions of the interrelationship between organism and world (Brown and Toadvine 2003, p. xiii). “Nature” as a concept and entity in this discipline, is necessarily encountered by a subject exercising agency through inquiry. What shape does a plant make as it grows? What rhythms do its leaf patterns remind us of? What is the weird and wonderful way a flower unfurls or a seed ball explodes? How interested can you be with your whole body? Seeing improvisation and ecological practice as paradoxical relieves both projects of weighty self-importance, and frees up a space for play. “By opening a little space for play, no matter how narrow its window, something is being dislocated” writes Verena Conley (Conley 1997, p. 110), summarizing Michel de Certeau’s discussion of play in social space as a key contribution to poststructuralist notions of the environment. For Conley, the dislocation offered by paradox enables “ecological practice” to be individually experienced through improvisation, sensation, action and revision, rather than mandated through imposed definition. Ecologist Aldo Leopold has said that “a thing is right when it tends to preserve the integrity, stability, and beauty of the biotic community. It is wrong when it tends otherwise” (Drengson and Inoue 1995, p. 4). Words such as these can be seen to offer limited definitions of what constitutes right and wrong action, ecologically. Active paradox, however, can suspend moralistic or binarized logic and give a platform to perception at the surface, or a kind of a priori willingness to observe and respond to a range of crises or situations in the world at the point of our immediate contact with them. Working with the children to develop attention to local phenomena – butterflies, plants, floods, monkeys, road works – brought about material for dance improvisations that implicated us within the environment as perceivers and responders. What if my whole body at once has the potential to perceive here, spatially including everything I see and everything I can’t see, now, and now, and now? What if Now is my past, present, and future here, here, and here? (Hay 2000, p. 104). As an active paradox, this score offers one way to circumvent the problem of dualities such as here versus there, now versus then, or soon versus now. By constructing an open-ended riddle that presupposes the body’s movement to be a sufficient response to the question, Hay’s scores focus attention on the emerging realm of the possible: the “what if?”. Chrysa Parkinson who has worked with Hay in performance development, takes the idea of paradox into her own teaching and working practices in order to focus on sensing. 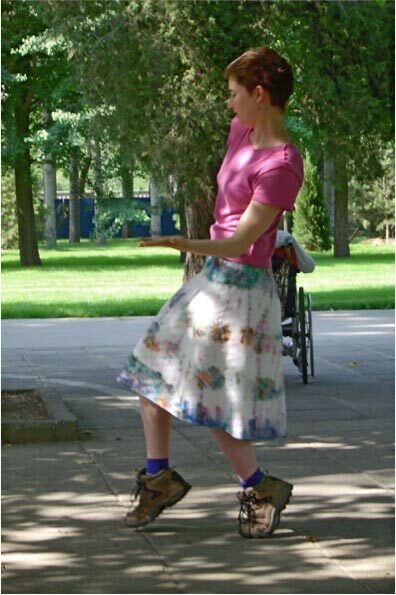 Workshops she teaches explore what happens when movement is performed not as a practice of seeking formal or image-based ideals, but as a task of exploring “perception of movement” (Parkinson 2006, p. 43). What if the floor is front? What if I include you in my dancing, and include is the opposite of control? What if I perform movement that is explicit and unrecognizeable? To experience this on a small scale, the reader is invited here first to make an explicit hand gesture, then to try to perform an explicit and unrecognizeable hand gesture. Through these scores, movement, which Parkinson calls “a material field with a non-material nature” (2006, p. 44), becomes the medium into which an attentive perceiver pours his attention. The non-material nature of this field requires the practitioner to practice awareness of change, rather than focusing on static forms or ideas. Cognizant of their entry into, participation in and alteration of that field through performance, dancers can investigate the extent of their perception and learn how that brings about a finer understanding of their relationships with other things. This practice of awareness of relationships through movement or change offers a starting place for eco-phenomenological participation. Acknowledgement is the purpose of the improvisation score. Andy Fisher, author of Ecopsychology describes the importance of “acknowledging the human-nature relationship as a relationship” (Fisher 2002, p. 8, emphasis mine) to developing meaningful interaction between oneself and the natural world. By admitting the existence of this paradoxical relationship between humans and the natural world (paradoxical because as intellectuals we are compelled to articulate the obvious in order to engage with it) we can look more closely at how our attentions create and affect this relationship. Improvising with active paradox can serve to establish such an indeterminate and questioning stance toward the human/nature relationship. Through “trying on” the imaginary clothes of a plant’s form, qualities and movement, a Twig Dance performs the paradoxical possibility of shared likenesses between human and plant body. The proposition is ridiculous and impossible, but it is the lively act of practicing this active paradox that serves as imaginative research into our relationships with things, through a kind of performative empathy with the non-human. I try on the sensation of growing buds pushing through the tips of twigs, “feeling” the effects of rooting, twisting, leaning, opening, swaying growth. The practice of “becoming” denies power to any idea that we know what a human body is and can do, or that we objectively know what a plant body can do. I take Spinoza on board, who in 1677 claimed “We know not what a body can do”. I remember Elizabeth Grosz describing Nietzsche: “a philosophy shows itself in what it enables bodies to do” (Grosz 1994, p. 127). I propose a third possibility: by embodying parts of the environment we can learn what many different bodies can do. Figure 6. 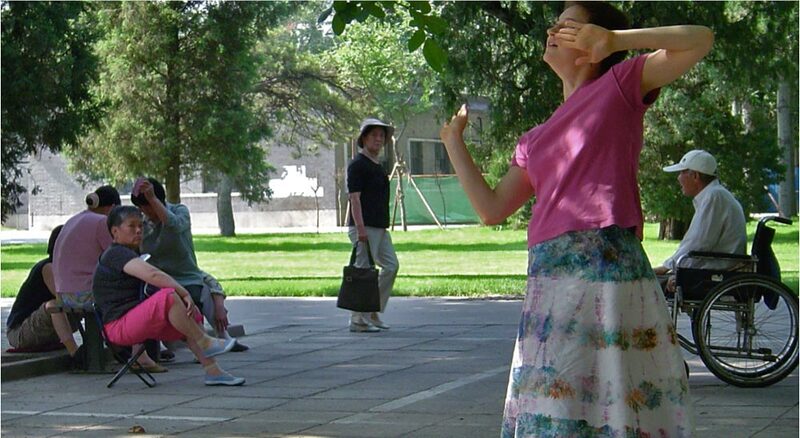 Twig Dance in Beijing Park 1. Photo: Richard Sarco-Thomas. Figure 7. Twig Dance in Beijing Park 2. Photo: Richard Sarco-Thomas. Figure 8. Twig Dance in Beijing Park 3. Photo: Richard Sarco-Thomas. Taking paradox into practice in order to access perception, improvisation offers a useful method of action research in both biological and cultural environments. In Twig Dances and the TWIG Project, improvisation, as a method of engaging with a variety of contexts, proved an essential part of the transversal methods of “ecological” research, offering a means for experience-based observation, reflection and action. What if twigs and cells are intelligent, and intelligent is the opposite of certain? Dr Malaika Sarco-Thomas is Head of Dance Studies in the School of Performing Arts at the University of Malta, co-director of Contact Festival Dartington, and co-organiser of Contact Improvisation Malta. This essay is an adaptation of a chapter from her PhD thesis Twig Dances: Improvisation Performance as Ecological Practice (2010) Dartington College of Arts. All images are by Richard & Malaika Sarco-Thomas, and used with permission. 15) See Emily Brady (1998) for a description of how imagination can enhance perceptual and aesthetic experiences of nature by facilitating modes of understanding through identification (pp. 143–44). Abram, D. (1997) The Spell of the Sensuous – Perception and language in a More-Than-Human World. New York: Vintage Books, Random House. Brady, E. (1998) “Imagination and the Aesthetic Appreciation of Nature”, The Journal of Aesthetics and Art Criticism, 56 (2), pp. 139–147. Chappell, T. D. J. (ed.) 1997. The Philosophy of the Environment. Edinburgh: Edinburgh University Press. Macnaghten, P. and Urry, J. (eds.) 1998. Contested Natures, London: SAGE Publications. ——– (1963) The Primacy of Perception; And Other Essays on Phenomenological Psychology, the Philosophy of Art, History and Politics. Edie, J. M. (ed.) Evanston: Northwestern University Press. Oelschlaeger, M. (ed.) 1995. Postmodern Environmental Ethics. Albany: State University of New York Press. Soulé, M. and Lease, G. (eds.) 1995. Reinventing Nature? Responses to Postmodern Deconstruction. Washington D.C.: Island Press. Tilley, C. 1994. A Phenomenology of Landscape: Places, Paths and Monuments. Oxford: Berg Publishers.